The Charlotte theme comes with built-in custom category pages. All of the categories on your site will automatically format into the grid format shown below. In this article, we'll go over some common questions and issues with the category pages. By default, the category title ("Style" shown in the screenshot above) will not display. Click here for instructions. The Sort By menu is comprised of the subcategories for whatever category you're in. 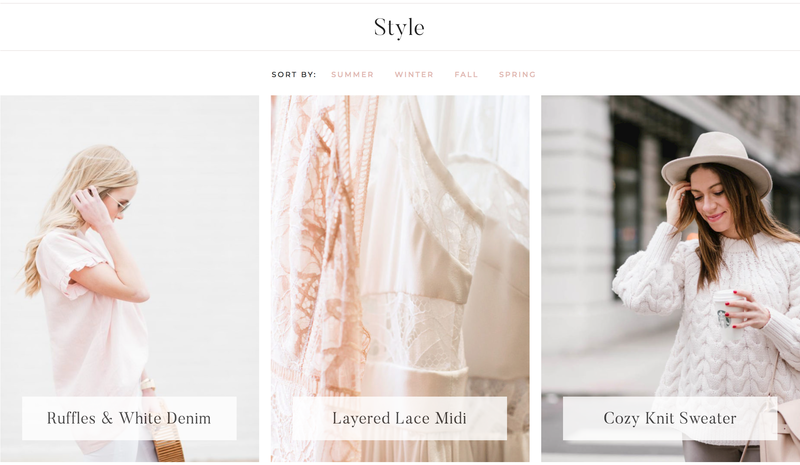 In the screenshot above, Summer, Spring, Fall, and Winter are subcategories of the Style category. To create subcategories, go to WordPress > Posts > Categories. On the left, give your new subcategory a name. Under the "parent category" drop-down, select the category you would like it to display under. Then click Add New Category. Repeat for as many subcategories as you need. Once you've set up subcategories, the Sort By menu will automatically display on the parent category page. The Sort By menu also displays on all subcategories within the parent category for easy navigation. If the images on your category pages are displaying at "inconsistent" sizes, you'll need to regenerate your thumbnails. If some of your images are still not displaying correctly after regenerating, they're likely not large enough to be resized – see this article. If you would prefer to use a different image size on the category pages (i.e. square or horizontal images), click here for the tutorial.